Saurabh Chaudhary wins Gold in Junior Men's 10m Air Pistol at ISSF World Championship. 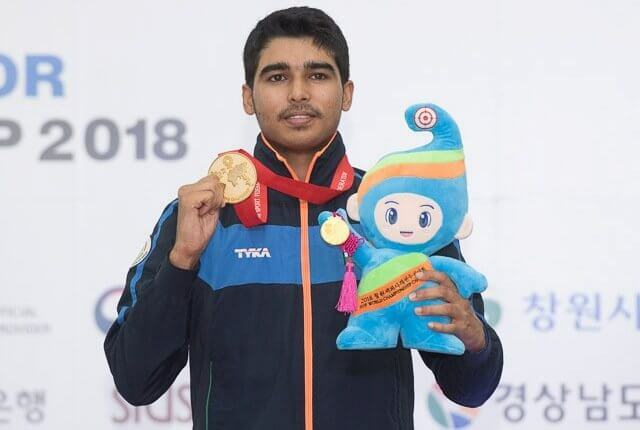 Saurabh Chaudhary shot a junior world record of 245.5 to win the gold medal in junior men’s 10m air pistol at the 52nd ISSF World Championship in Changwon, Korea. The 16-year old Saurabh shattered his own world record of 243.7 which he had set at the ISSF Junior World Cup in Suhl, Germany in June this year. Saurabh’s score is infact 1.9 point more than the senior world record held by Ukraine’s Oleh Omelchuck. Saurabh, who became India’s youngest shooter to win an Asiad gold last month, qualified for the final with the third best score of 581. In the finals, Saurabh took the lead with a perfect 10.9 on his eighth shot and thereafter maintained his lead throughout to claim the title with a margin of 2.4 points. Arjun Cheema wins Bronze in Junior Men’s 10m Air Pistol. 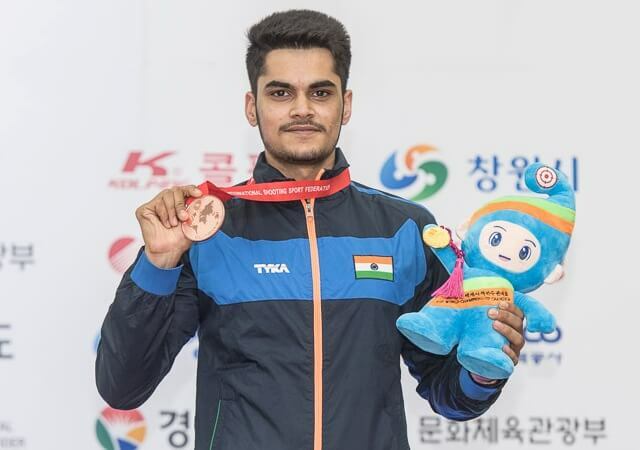 Arjun Cheema won the bronze with 218.0 in 22 shots, adding to the gold — he won in the junior men’s 50m pistol — on the opening day of the competition. In the qualification, Arjun shot the sixth highest score of 577. The silver was won by Korea’s Hojin Lim with 243.1. Coincidentally Hojin had also won a silver at the Junior World Cup in Suhl, finishing behind Saurabh. The third Indian in the fray, Anmol Jain finished tenth with 572, missing the final by two points. From left: Saurabh Chaudhary, Anmol Jain & Arjun Cheema win Silver in Junior Men’s 10m Air Pistol Team. 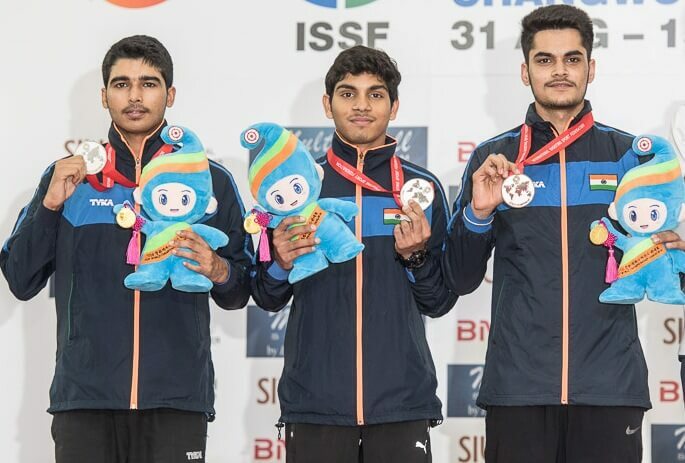 The Indian trio of Saurabh, Arjun and Anmol claimed silver in the team event with a score of 1730/1800. The gold was won by the Korea with a world record of 1732 while Russia took the bronze with 1711. This was Saurabh’s third medal of the competition after the bronze he had won along with Abhidnya Patil in the junior 10m air pistol mixed team on Tuesday. 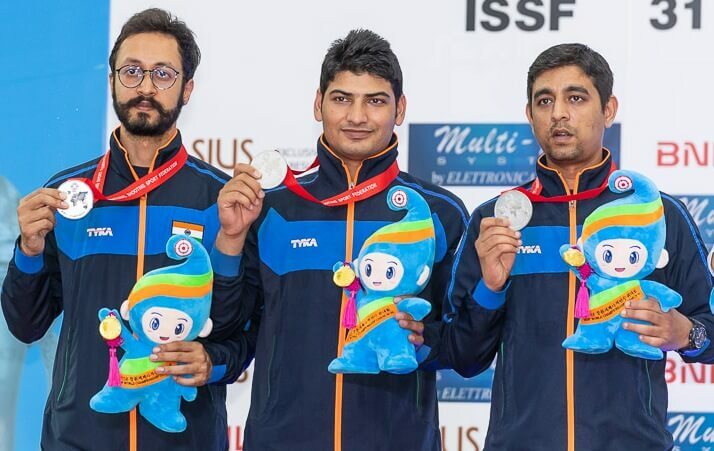 In the men’s 10m air pistol, the Asian Games bronze medallist Abhishek Verma shot a score of 583 and was the only one who made the cut for the final. However, the 29-year-old Abhishek was the first to be eliminated on the 8th place with 118.0, missing a great opportunity to grab one of the four Olympic quota places on offer. From left: Abhishek Verma, Om Prakash Mitharval & Shahzar Rizvi win Silver in Men’s 10m Air Pistol Team. Om Prakash Mitharval, who had won gold in 50m pistol on Tuesday, shot 579 to finish 18th while the World No. 1 Shahzar Rizvi shot 576 to finish 30th. Star shooter Jongoh Jin of Korea came back from a 6.2-point deficit and won his second consecutive title in men’s 10m air pistol. The local favourite was tied on a score of 241.5 with Russia’s Artem Chernousov but prevailed in the shoot-off by shooting a 10.3 as against a 9.5 by Artem. The bronze was won by another Korean shooter Daemyung Lee with 220.6. The team of Abhishek, Mitharval and Shahzar won the silver with a score of 1738. Korea won the gold with 1747 while Russia took the bronze with 1736. 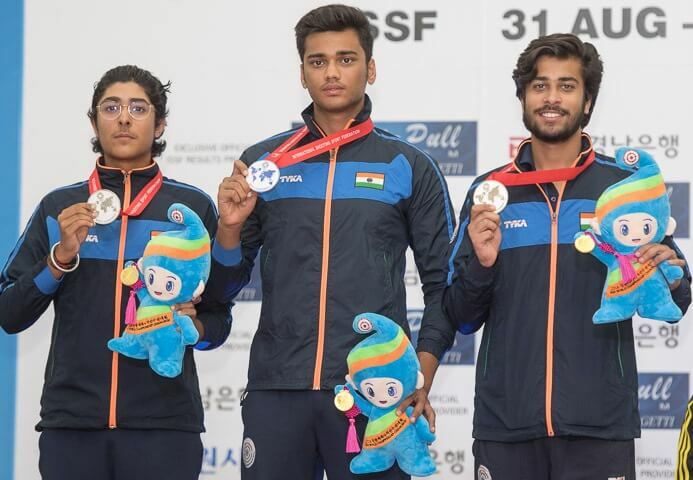 Indian junior men’s team of Aman Ali Elahi, Vivaan Kapoor and Manavaditya Rathore won the silver with 348. In fact, the gold was lost on the count-back to Australia, after the two teams were tied on 348. Italy took the bronze with 346. From left: Vivaan Kapoor, Manavaditya Rathore & Aman Ali Elahi win Silver in Junior Men’s Trap Team. In the individual event, Aman had to overcome a shoot-off to get to the final after five shooters had tied for the last three spots on 118. However in the final, Aman was the first to be eliminated on the sixth place with 10/25 hits. Vivaan shot a qualification score of 117 to finish 9th while Manavaditya finished 17th with 113. The gold was won by Australia’s Nathan Steven Argiro with 42. Silver was won by Logan Joseph Lucas of USA with 41 while Italy’s Lorenzo Ferrari took the bronze with 31. Men’s 10m Air Pistol: 1. Jin Jongoh (Korea) 241.5 (10.3) 582; 2. Artem Chernousov (Russia) 241.5 (9.5) 587; 3. Daemyung Lee (Korea) 220.6 (584); 8. Abhishek Verma (India) 118.0 (583); 18. Om Prakash Mitharval (India) 579; 30. Shahzar Rizvi (India) 576. Men’s 10m Air Pistol Team: 1. Korea (1747); 2. India (1738); 3. Russia (1736). Junior Men’s 10m Air Pistol: 1. Saurabh Chaudhary (India) 245.5 WRJ (581); 2. Lim Hojin (Korea) 243.1 (583); 3. Arjun Cheema (India) 218.0 (577); 10. Anmol Jain (India) 572. Junior Men’s 10m Air Pistol Team: 1. Korea (1732 WRJ); 2. India (1730); 3. Russia (1711). Junior Men’s Trap: 1. Nathan Steven Argiro (Australia) 42 (119); 2. Logan Joseph Lucas (USA) 41 (120)9; 3. Lorenzo Ferrari (Italy) 31 (118)5; 6. Ali Aman Elahi (India) 10 (118)1; 9. Vivaan Kapoor (India) 117; 17. Manavaditya Singh Rathore (India) 113. Junior Men’s Trap Team: Australia (348); 2. India (348); 3. Italy (346).